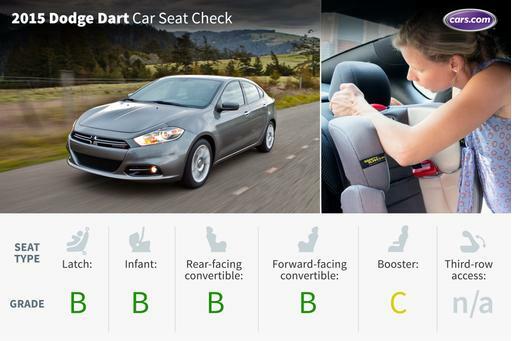 The compact-car segment is a fiercely competitive one, and Chrysler has a lot riding on its new-for-2013 Dodge Dart. The sedan is the first Chrysler Group product based on a Fiat platform, and it replaces the unloved Caliber hatchback in Dodge's lineup. Most families may opt for a larger vehicle to cart the kids around, but the Dart deserves a look thanks to its easy- to-access Latch anchors. For the Car Seat Check, we use a Graco SnugRide 30 rear-facing infant-safety seat, a Britax Roundabout convertible child- safety seat and Graco high-back TurboBooster seat. 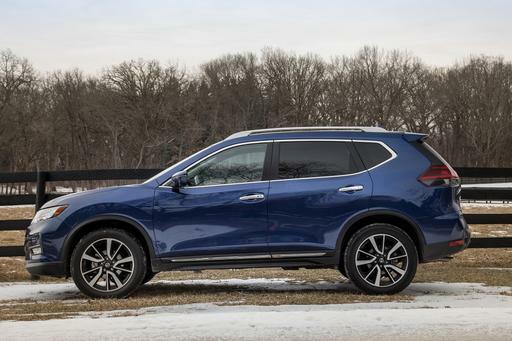 The front seats are adjusted to a comfortable position for a 6-foot driver and a 5-foot-8 passenger. The three child seats are installed in the second row. The booster seat sits behind the driver's seat, and the infant seat and convertible seats are installed behind the passenger seat. We also install the infant seat in the second row's middle seat with the booster and convertible in the outboard seats to see if three car seats will fit. If there's a third row, we install the booster seat and a forward-facing convertible. Latch system: This five-passenger compact sedan has two sets of Latch anchors in the outboard seats. They are mounted high in the seat bight, where the back and bottom cushions meet, so they’re easy to find and use. Booster seat: The seats are contoured and cushiony, but the booster still fit well. The buckles are set low in the cushions, so they might be difficult for little fingers to access. The buckles are on stiff bases, however, which helps keep them in place. Convertible seat: The rear-facing convertible fit fine on the seat, but the front passenger had to move forward a little to accommodate it, though she still had ample legroom. Installing the convertible in the rear-facing position was a little trickier. The cushiony, contoured seats made it difficult to settle the child seat. After removing the head restraint and repositioning it a few times, we couldn’t get the base to sit flat on the bottom cushion. Three tether anchors are located on the rear shelf. There's plenty of clearance surrounding the anchors, so they were easy to connect to. Infant-safety seat: Again, this seat fit fine, but the front passenger seat had to be moved up a click. There was still a comfortable amount of legroom. Editor's note: For three car seats — infant-safety seat, convertible and booster seats — to fit in a car, our criterion is that a child sitting in the booster seat must be able to reach the seat belt buckle. Parents should also remember that they can use the Latch system or a seat belt to install a car seat.